Why should the army have all the good drones? This hack is long overdue. It's been at least two years since I started thinking about how (and whether) to do it, and it's finally coming together. 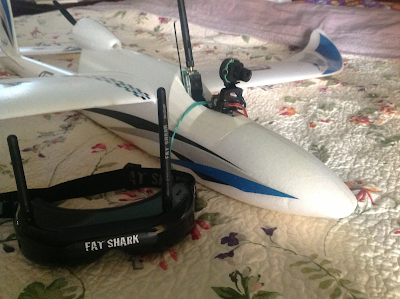 Earlier this month, I finally pulled the trigger on eBay and got a FatShark FPV video system. The FatShark is a combined video-receiver and video-goggles system. It includes a small video camera and 5.8GHz radio transmitter; the video plays through the goggles. The camera is mounted on a servo-controlled 2-axis gimbal, and a 2-axis gyroscopic/magnetic sensor on the goggles transmits a 433MHz signal to a receiver which controls the gimbal. Net result: A videocamera small enough to mount on an RC plane, that not only shows you the view from the cockpit but tracks your head motion and moves the camera accordingly. Control of the plane is achieved through the regular 2.4GHz RC transmitter/receiver: the FatShark video is a separate system operating on a completely different set of frequencies. I needed a good way of mounting the camera on the plane. Needed a good plane, too... well, a not-so-good plane, actually; something slow and forgiving and not "special" in any way to either my son or myself. Most of our planes are hand-crafted balsa constructions that take a month to build and involve some emotional cost if they crash, and I figure this thing will crash. 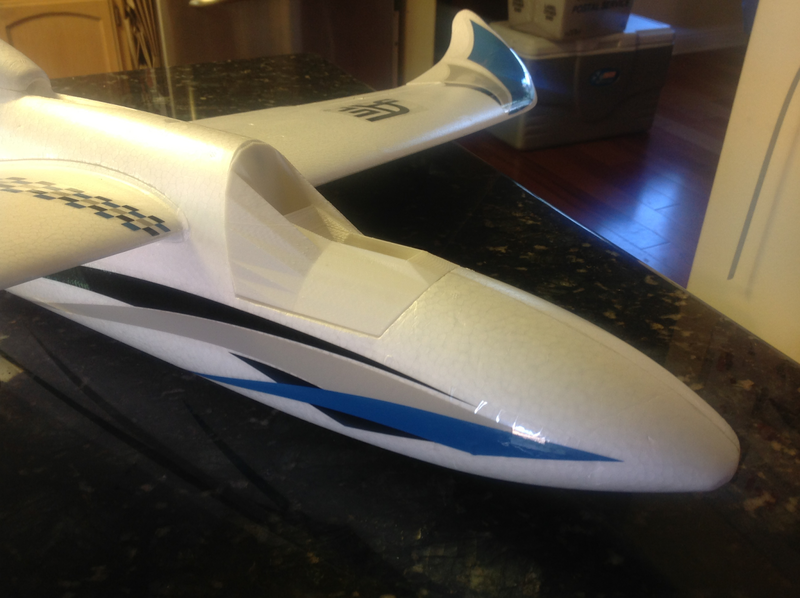 We have a "Sky Surfer" that someone gave us, and it fits the bill perfectly: slow, solid foam construction, underpowered (by our standards) and boooring. Someone gave it to us; we use it for teaching other people how to fly RC. It's an absolute pig of a plane, but I think that's probably what we need here. It's also a pusher-prop plane, so there's no obstruction of the front view. The cockpit of the plane is removable, and I now have access to a 3D printer; so I used Google Sketchup to design and print a replacement cockpit that can hold the radio gear. 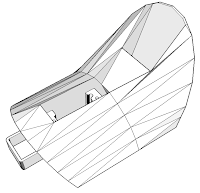 The cockpit just drops in where the stock cockpit came out; no modification to the plane is required. The pan servo on the video gimbal screws into the front slot on the cockpit, with clearance for wiring and for slightly larger servos as well. The angled slot at the back is designed to hold the video transmitter: the antennas are nicely exposed, and there's plenty of airflow onto the transmitter which otherwise gets quite hot. The pan/tilt receiver is stuck to the bottom of the cockpit with doublestick tape. 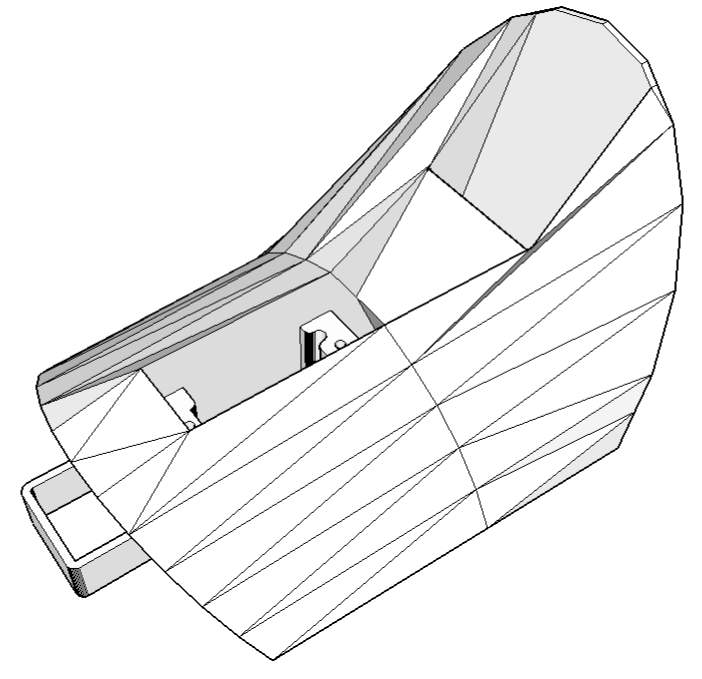 The original cockpit is held in place by the front tab you can see on the print, and by a magnet that grips a 1-square-cm metal plate on the top-back surface of the cockpit. I designed this replacement cockpit with a recess to mount that plate, but I'm a bit leery of having things come loose in negative-g maneuvers so I strapped the cockpit down with a couple rubber bands just in case. Now if we just had some good flying weather... Maybe tomorrow! This will be a new experience for me: I've been flying RC planes since high school, but never from "inside the plane!" Files for this project are available at Thingiverse. I reached a fascinating technological milestone this weekend. 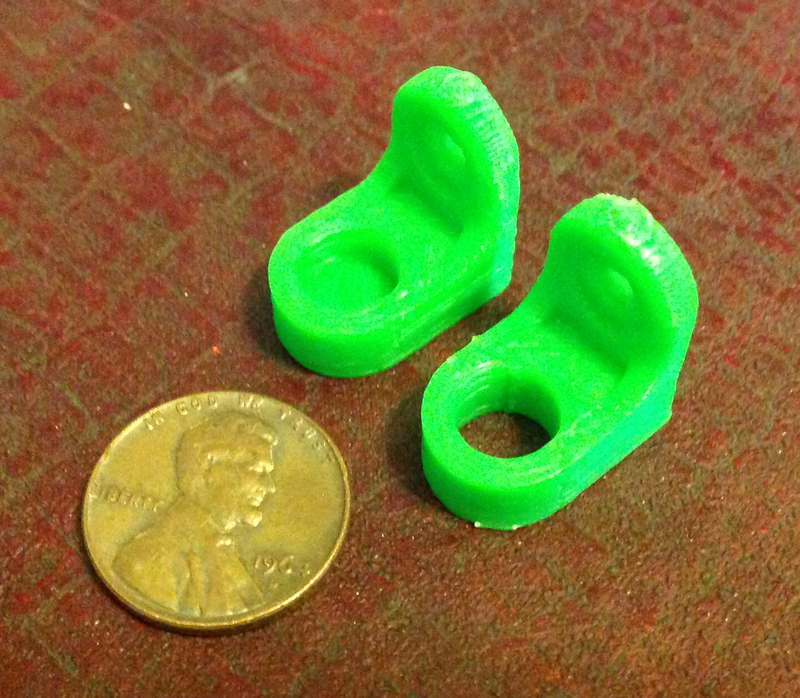 I needed some small plastic brackets to hold a sensor for a new experimental apparatus I'm building for the fall semester's Advanced Lab course. 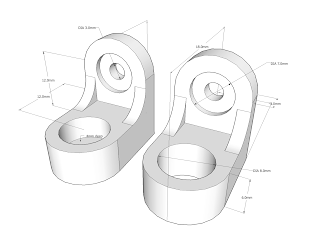 So I designed them, in 3D, on my laptop. This took about 30 minutes. When that was done, I went to my lab and printed them, which took another 30 minutes. Printed. Parts. Real parts. Physical objects. From "Light bulb!" 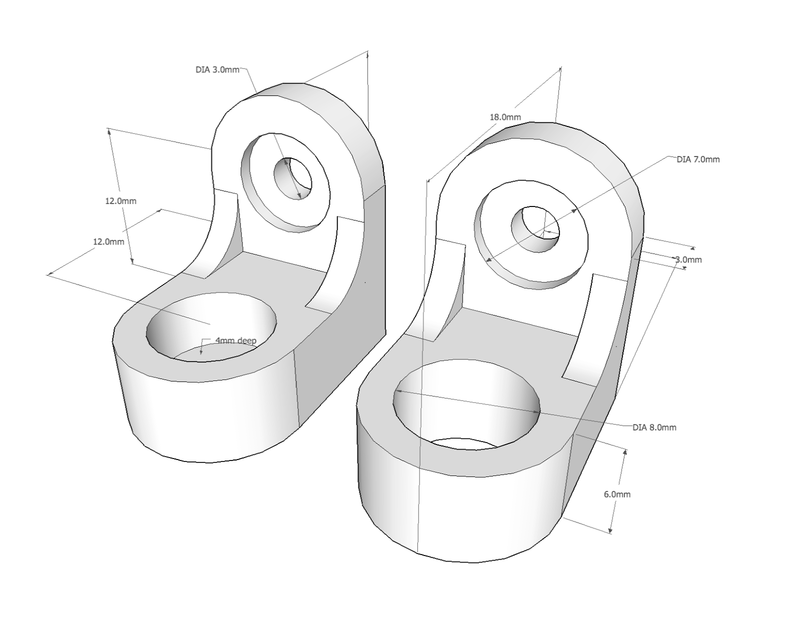 to "Here are the custom parts you just designed" in an hour. SO COOOL!!! This is a GOOD time to be a nerd. 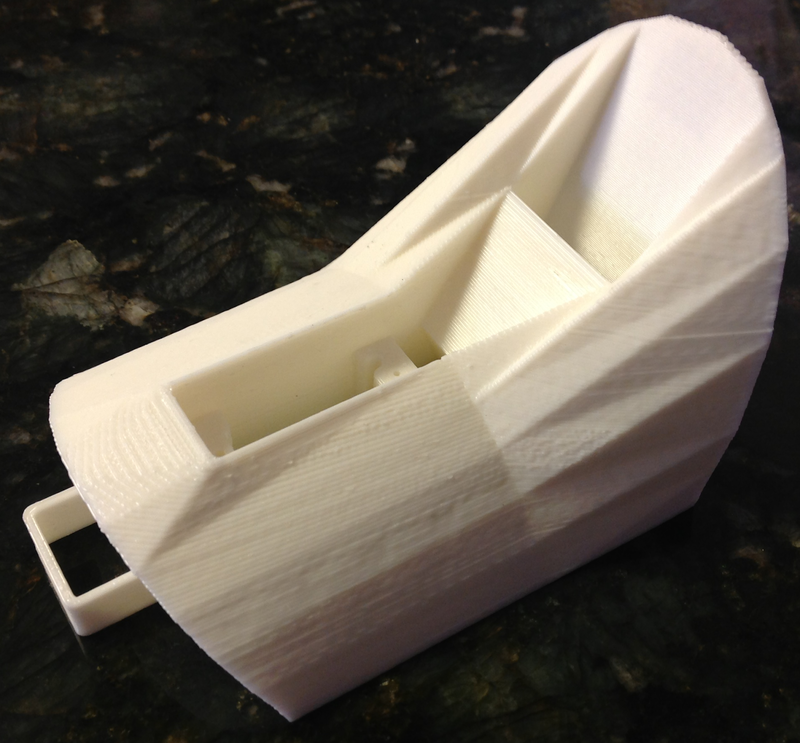 Technical details: parts designed in Google Sketchup, printed in ABS on a Solidoodle 2. This blog post should in no way be construed as an endorsement of Solidoodle, where the company policy appears to be to ship replacement parts on a schedule that would make glaciers wonder about the hold-up, and whose printer is currently printing using a jury-rigged extruder heater element that would make MacGyver shudder.